As a pilot in WWII, George knew B-17 planes like the back of his hand. When his daughter surprised him with a special ride in the same type of bomber for his 90th birthday nearly 70 years later, he could have been blindfolded and known exactly where he was. It had been almost 70 years since George Jacobs had been in a B-17 plane—the same model that carried him over the smoking ruins of once-grand European cities, swerved and dipped at his command to avoid enemy fire, and whose cold aluminum walls were once “home” to him and his crew. But the moment he stepped back in one of the large bomber planes known as the “Flying Fortresses,” the memories came rushing back: The jarring whir of engines perpetually out of sync. The thick smell of the smoky, dark fumes. The biting chill of high altitudes without the buffer of insulation. George’s reunion ride was a special gift from his daughter Joy for his 90th birthday in 2014. Joy knew her father would love to relive his days as a pilot in the Army Air Corps, the branch of the Army which predated the Air Force until 1947. From a young age, George was interested in planes. At age 16, he learned how to fly with the Civil Air Patrol, a volunteer contingent that today is part of the Air Force. He joined the Air Corps in 1942 as a navigation cadet, enlisting when he turned 18. He earned his wings as a second lieutenant in 1944. During his time in the war, George’s plane was home. The massive B-17 bombers had a reputation for being tough—almost as tough as the pilots who operated them. The front of the cockpit, where George sat, was transparent, offering a striking panorama of both awe-inspiring views and heart-pounding dangers. “I was eye to eye with the German and the guy who was trying to shoot me,” George said. Though he started as a pilot as World War II was nearing its end, George piloted numerous flights. The ones that left the strongest impression were humanitarian missions. 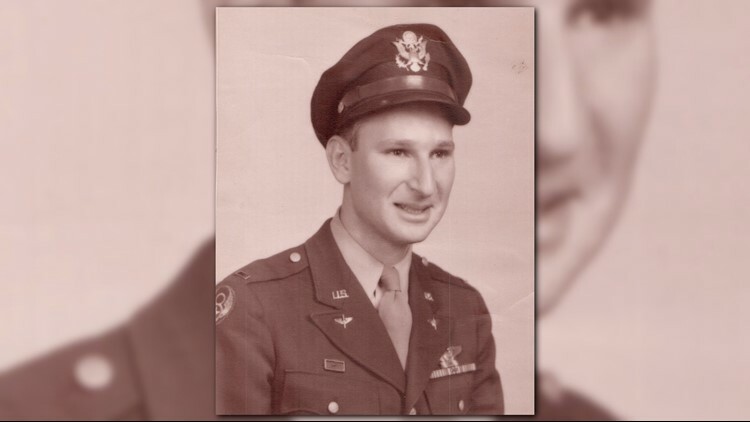 He dropped food over The Netherlands and brought medical supplies to a liberated concentration camp—harrowing memories that have stuck with him throughout his life. At the end of the war, George went on to have a successful career in government and journalism. He served as a member of the State Department’s Senior Executive Service (SES) and began his own broadcast technology consulting business. He wouldn’t touch another B-17 until nearly 70 years after his last wartime flight. Through a friend, his daughter Joy learned of a way to book historic flights. So she covertly made a reservation and told her dad to join her for lunch at a restaurant in the airport in Frederick, Md. When they arrived, he was shocked to find out he was about to board the same type of plane that he flew so many years ago. “It was the first time I saw him speechless,” Joy said. “It was like a complete blank, I was like, ‘What, am I dreaming? What is she talking about?’” George said. As soon as he stepped inside, it was like he had never left the cockpit. “I could have been blindfolded and knew exactly where I was just by the little bit of smell of the fumes,” George said. He navigated the plane on a mock bombing mission with ease. George wasn’t the only one excited about the opportunity; Joy also appreciated a chance to learn more about B-17s herself. Though she did not ride in the plane with her dad, she was able to see the Flying Fortress up close and take photos. “I think it bonded us so much closer, even though we’re a close-knit family anyhow,” Joy said. She had heard many stories from her dad about his time in the war, but seeing the plane gave her a new appreciation for his service. “Everything I had heard about… suddenly it had a visual to it,” Joy said. It was a special way to honor her dad, who means a lot to her. “He’s a great dad, and it was just a once in a lifetime you didn’t want to pass up, and he’s extraordinary,” she said.